Anchorage Ultimate is excited to partner with Anchorage Sports Association and USA Ultimate to offer a league for 5th-8th graders this year! More information here. 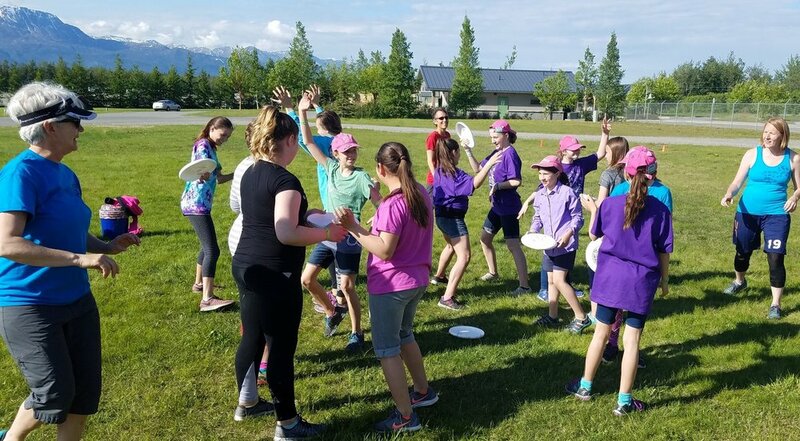 Anchorage Ultimate is currently coordinating with elementary and middle schools in Anchorage to set up after school programs in the spring and the fall to help integrate Ultimate into the Anchorage Community. If you are involved with a school that would be interested in setting up a program, contact us! We can help set up a one time field day or youth game/clinic. We can also help set up a weekly after school program at your school. We work on a volunteer basis and there is no cost to schools. 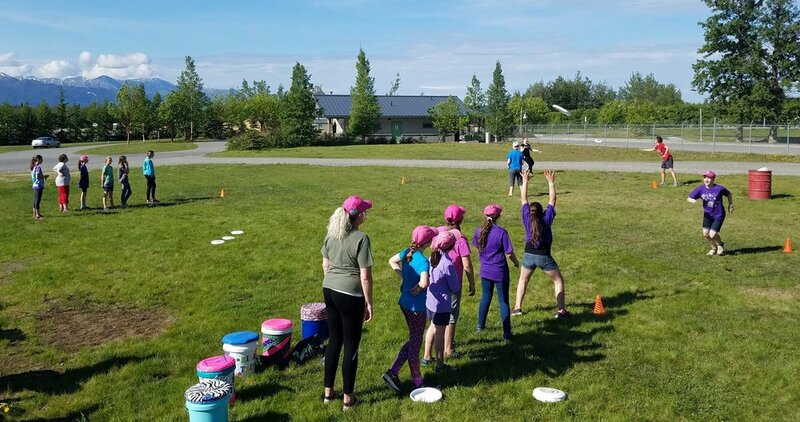 Anchorage Ultimate volunteers put on clinics at the Annual Girl Scout Encampment in Palmer at the State Fair Grounds in 2017. Girls from all over the state had the opportunity to learn about the sport of ultimate and play outside in the sunshine. They participated spirit games, came up with cheers, practiced throwing and then got to play some 'real' games. Everyone had an amazing time and we look forward to next year! Girls scouts playing a spirit game called mingle to warm up and get to know each other at the start of the clinic. Leaders and girl scouts participated in a throwing relay to practice running & catching, stopping with the disc and throwing to space before playing a full game. And finally, the 'real' game. Several Anchorage elementary schools have been offering after school programs in the fall and spring. "The kids at Inlet View LOVED working with Anchorage Ultimate super stars – Brian, Jacob, and Heidi. Our 4th through 6th graders had a blast learning the basics of Ultimate during a six week session of PLAY! Our frisbee club was open to boys, girls, and all skill levels, and I can honestly say that EVERYONE HAD FUN!" Anchorage Ultimate has an annual booth at the August Family Health and Safety Day to share the sport of Ultimate with the community. We host a community game for youth and families and have a blast playing on the park strip. Our Booth and Family Health and Safety Day. Thanks to everyone that stopped by, look for us next year! Part of our booth involved a raffle. Here's a photo from our raffle winner Ivon and his daughter who won an Anchorage Ultimate disc! Thanks for stopping by our booth!